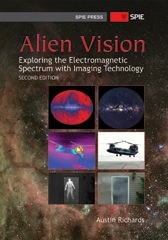 I recently received a review copy of a book called Alien Vision: Exploring the Electromagnetic Spectrum with Imaging Technology, published in 2011 through professional optical engineering society SPIE. The author, Austin Richards, is a senior scientist at FLIR Systems, and does a great job of explaining his subject in straightforward terms without being patronizing or sacrificing technical rigor. The book is pricey for a popular treatment, but I’m enjoying it tremendously. And the premise was so intriguing to me that I decided to see if I could put together my own imaging-based tour of the spectrum using web-based resources. This post is the result. Here are 17 images captured at electromagnetic wavelengths ranging from one meter down to one trillionth of a meter, from radio waves to gamma rays, arranged in order of increasing frequency / energy. Each is accompanied by a caption identifying the instrument used to record the image, the approximate wavelength at which it was recorded, the subject, and a link for those seeking more information.